It's high tide in Cox's Bazar and there's a traffic jam right on the beach at Bangladesh's most prominent seaside resort. The lone road that leads south to the sprawling new camps sheltering hundreds of thousands of Rohingya refugees is closed for repairs. All the traffic has been diverted onto the gray sand beach, where people are taking selfies and strolling in the shallow surf. Motorized rickshaws get stuck in the sand on the beach in Cox's Bazar, Bangladesh. All traffic heading south out of town was diverted on to the beach when the main road was closed for repairs. 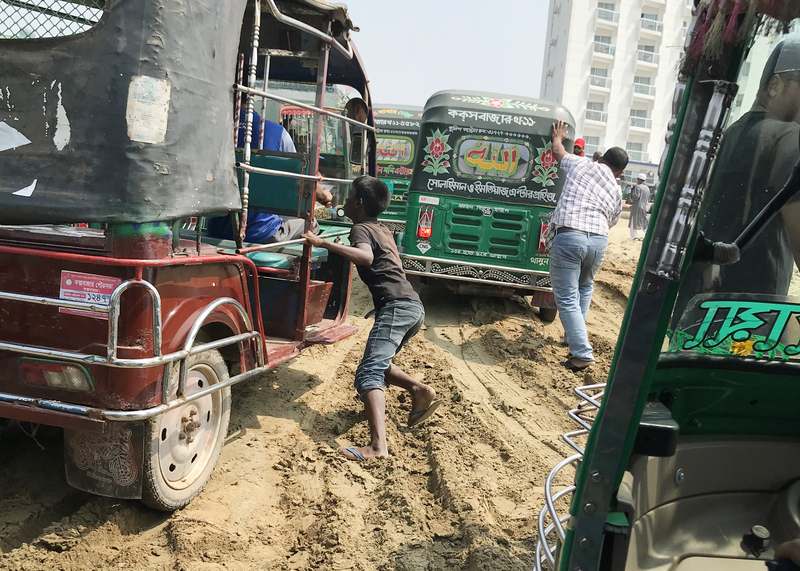 Little green rickshaws jostle with passenger vans and pickup trucks to get over a sand dune and back onto the paved roadway to head in the direction of the camps. At high tide, some of the vehicles get stuck in the wet sand, blocking those behind them. The sudden influx of 700,000 refugees in 2017 has had a huge negative impact on the local community, says Mohammad Abul Kalam, the head of Bangladesh's Refugee Relief and Repatriation Commission in Cox's Bazar. "We're being outnumbered by the sheer number of the refugee population," he says. Beyond this, "The infrastructure has been under unbelievable pressure," Kalam says — not just from the refugees themselves, but also from the tremendous aid effort underway to keep so many people sheltered, fed and healthy. Kalam is the Bangladesh government's top local official regarding the Rohingya. He says the area's roads and bridges are being beaten up by convoys of aid vehicles shuttling from Cox's Bazar to the camps. "They were not meant for this much population," he says. Kalam points out that Ukhiya, the administrative district that includes the camps, has a population of 230,000 people. "Yet we now have more than 700,000 in the refugee population," he says. "So the entire demographic balance has been reversed." Late in 2017, Rohingya fled from Myanmar into Bangladesh to escape attacks by soldiers and pro-government militias. The U.N. and human rights groups condemned the attacks as a campaign of ethnic cleansing and an organized effort to drive the Rohingya out of Myanmar. Thousands of people were killed. The refugees who arrived in Bangladesh in 2017 joined other Rohingya who'd fled earlier waves of violence and pushed the total number of Rohingya refugees in the area up to nearly 1 million. Kalam notes that the refugees' activities have been detrimental to the environment. They've cut down all of the forests surrounding the camps for firewood in what is a nature preserve. They've diverted streams as they've terraced hillsides to build new shelters. 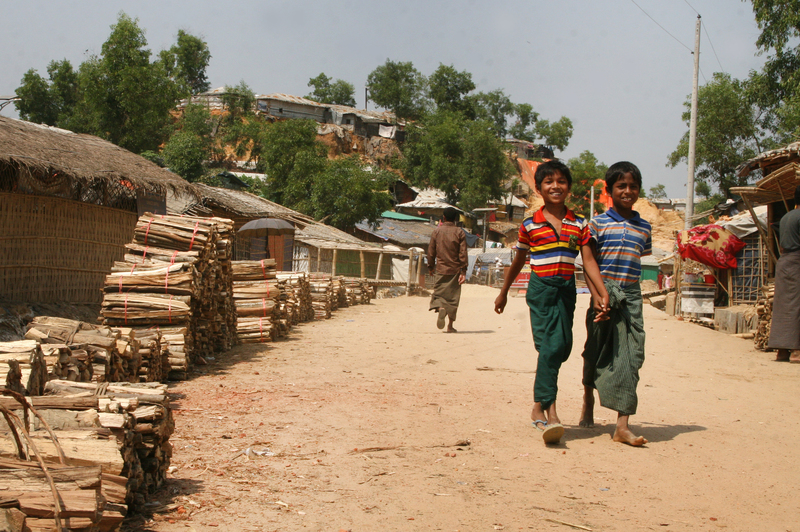 Firewood is stacked for sale in a Rohingya refugee camp in Bangladesh. Local residents complain that the Rohingya have cut down all the trees surrounding the camps and burned them in cooking fires. He claims they are driving up some food prices — while, at the same time, food aid diverted to local markets is driving down demand for Bangladesh-grown rice. And, he says, the refugees are pushing down wages by accepting jobs at lower pay than Bangladeshis are willing to accept. Aid convoys beat up the local roads and further congest what was already heavy traffic. The refugees are not supposed to leave the camps. Nor are they allowed to work in Bangladesh. Kalam says they do both. He doesn't blame them. "You cannot really stop people from being engaged in work of one kind or another," he says. "It always happens." But he says the Rohingya are taking away jobs from Bangladeshis, particularly low-skilled jobs on farms and other manual labor. The presence of nearly a million refugees is in this part of Bangladesh, he says, is unsustainable. "It's very, very difficult for us," he says. "We are already an overpopulated country with more than 160 million population in very limited space. It would be really very difficult for Bangladesh to allow them to integrate within our own society." Given the trauma that the Rohingya experienced in 2017, it appears unlikely that many will want to return to Myanmar anytime soon. Late last year, there was an effort to repatriate any Rohingya who wanted to go back. The Bangladeshi government offered free transportation and moving benefits. No one signed up. So Bangladesh last year proposed another solution: move from the overcrowded camps outside Cox's Bazar to a camp with brand-new dormitories that can accommodate 100,000 refugees. A satellite image shows the island of Bhasan Char in the Bay of Bengal, more than 15 miles from the Bangladesh mainland. 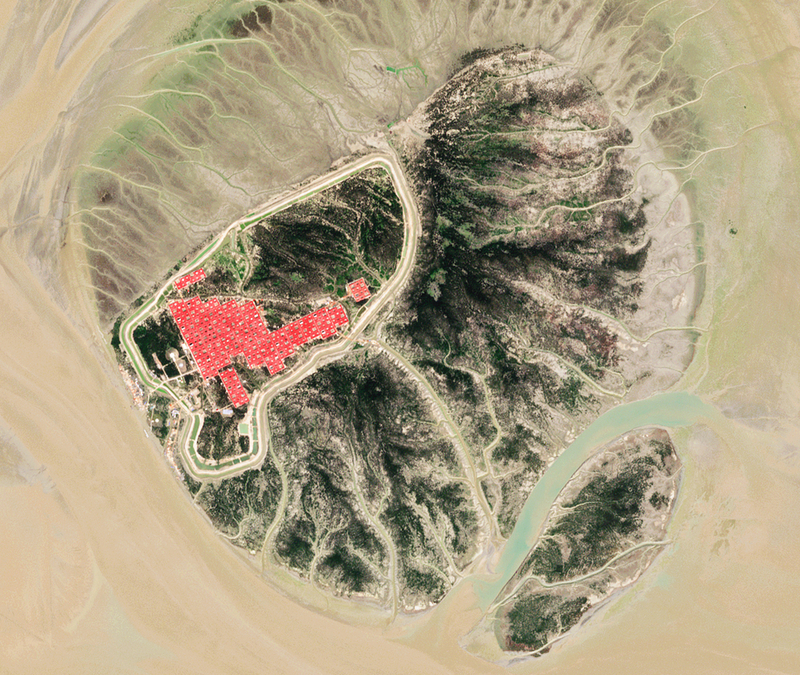 The Bangladeshi government is building dormitories (visible by their red roofs), which it says could accommodate roughly 100,000 Rohingya refugees. So far none have relocated to the island. The only problem: It's on an island in the Bay of Bengal, more than 15 miles from the mainland. The Bhasan Char island emerged 20 years ago, formed in the bay's shifting currents. It is uninhabited and was designated by the government as a forest reserve in 2013. Kamal says Bangladesh has spent $300 million building housing, concrete seawalls and cyclone shelters on the giant sandbar. "Very good quality shelters and other infrastructure are put in place there, including long barriers meant to secure the inhabitants from any cyclonic hit from the Bay of Bengal," he says. "The government is suspecting that the Rohingyas will have a better life there." But Meenakshi Ganguly, the South Asia director for Human Rights Watch, says it's a terrible idea. She warns the island will serve more as a detention facility than upgraded refugee housing. "The truth is these are people who are going to be locked on this island," she says. "Because they're not really allowed to leave." 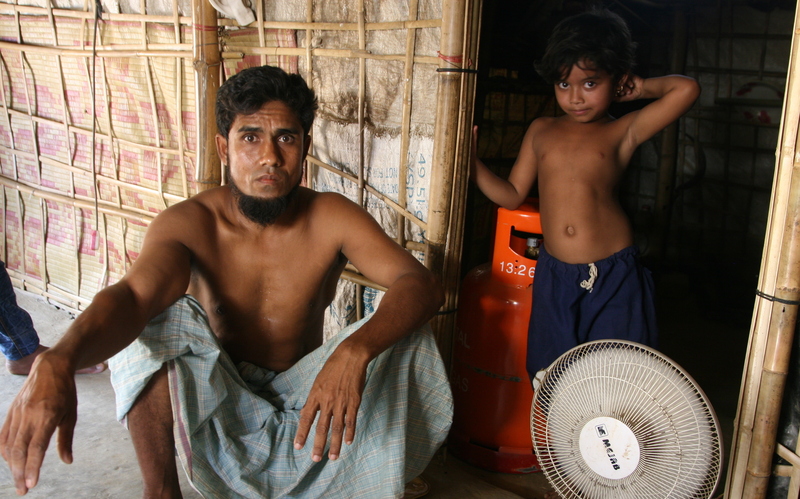 Hamid Hassin, sitting in his shelter in the Balukali refugee camp, says he has no desire to move to a new island camp being built for the Rohingya refugees. Most international aid groups have been skeptical of the plan to relocate refugees to Bhasan Char. Supplies, aid workers, even teachers would have to be ferried in by boat. The island is controlled by the Bangladesh navy and it's unclear if the Rohingya would have the same access to international aid that they currently do in the camps. Kalam insists refugees won't be forced to move to the island and any relocations will be voluntary. The government had planned to start sending them to the island April 15, but now it's unclear when it may begin. The government may find few takers. There's little enthusiasm among refugees in the sprawling Balukali camp. In his bamboo and tarp shelter, Hamid Hassin, 30, says he has no desire to move to the island. He doesn't want to be separated from other Rohingya in the camps and is worried the low-lying island could flood in a major storm. "We fled Myanmar to save our lives," he says. "I don't want to end up dying on that island."